For conspicuous gallantry and intrepidity above and beyond the call of duty in action with the enemy over Vegesack, Germany, on 18 March 1943, Lieutenant Mathis, as leading Bombardier of his squadron, flying through intense and accurate anti aircraft fire, was just starting his bomb run, upon which the entire squadron depended for accurate bombing, when he was hit by the enemy anti aircraft fire. His right arm was shattered above the elbow, a large wound torn in his side and abdomen, and he was knocked from his bomb sight to the rear of the bombardier's compartment. Realizing that the success of the mission depended upon him, Lieutenant Mathis, by sheer determination and will power, though mortally wounded, dragged himself back to his sights, released his bombs, then died at his post of duty. As the result of this action, the airplanes of his bombardment squadron placed their bombs directly upon the assigned target for a perfect attack against the enemy. Lieutenant Mathis' undaunted bravery has been a great inspiration to the officers and men of his unit. Lt. Jack Mathis' original Medal of Honor can be seen at the USAF Museum, Wright Patterson AFB, Ohio. He is buried in the Fairmont Cemetery in his home town of San Angelo, Texas. His brother 1lt Mark Mathis, who became a 359th BS Bombardier shortly after Jack was killed, was killed on 14 May 1943 on his fourth mission after bombing Kiel, Germany. The Mathis Municipal Airport, San Angelo, Texas was named in 1988 in honor of the Mathis Brothers. The Mathis Sports & Fitness Center, Goodfellow AFB, TX was dedicated and named in honor of Jack Mathis on 19 June 1966. For conspicuous gallantry in action against the enemy above and beyond the call of duty while serving as a radio operator-air gunner on a heavy bombardment aircraft in a mission over Bremen, Germany, on 20 Dec 1943. After bombing the target, the aircraft in which Sergeant Vosler was serving was severely damaged by anti-aircraft fire, forced out of formation and immediately subjected to repeated vicious attacks by enemy fighters. 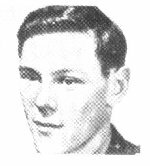 Early in the engagement a 20 mn cannon shell exploded in the radio compartment, painfully wounding Sergeant Vosler in the legs and thighs. At about the same time a direct hit on the tail of the ship seriously wounded the tail gunner and rendered the tail guns inoperative. Realizing the great need for firepower in protecting the vulnerable tail of the ship, Sergeant Vosler, with grim determination, kept up a steady stream of deadly fire. Shortly thereafter another 20 mm enemy shell exploded, wounding Sergeant Vosler in the chest and about the face. Pieces of metal lodged in both eyes, impairing his vision to such an extent that he could only distinguish blurred shapes. Displaying remarkable tenacity and courage, he kept firing his guns and declined to take first aid treatment. 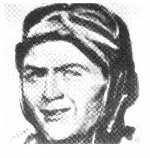 The radio equipment had been rendered inoperative during the battle, and when the pilot announced that he would have to ditch, although unable to see, and working entirely by touch, Sergeant Vosler finally got the set operating and sent out distress signals despite several lapses into unconsciousness. When the ship ditched, Sergeant Vosler managed to get out on the wing by himself and hold the wounded tail gunner from slipping off until the other crew members could help them into the dinghy. Sergeant Vosler's actions on this occasion were an inspiration to all serving with him. The extraordinary courage, coolness, and skill he displayed in the face of great odds, when handicapped by injuries that would have incapacitated the average crew member, were outstanding. President Franklin D. Roosevelt and Under Secretary of War Patterson presented the Congressional Medal of Honor to T/Sgt Forrest L. Vosler at the White House, on 31 August 1944. Forrest L. Vosler died on February 17, 1992 and is buried in Arlington National Cemetery in grave number 60-4924. His original Medal of Honor was donated to the Mighty Eighth Air Force Heritage Museum in 1997 and can be seen in the 303rd BG(H) showcase exhibit.